Of all the food-centric holidays, Thanksgiving may be the one that truly brings out our inner glutton. We celebrate with a feast that’s so expansive, the leftovers are often anticipated as much as (if not more than) the meal itself! With all that food, of course, there’s bound to be some food waste; even those coveted leftovers get relegated to the garbage can in a day or two if they’re not eaten. Thankfully (pun intended), with a little advance planning and a few Turkey Day tactics under your apron, you can serve up a delicious, satisfying, zero-waste Thanksgiving feast. 1. Choose recipes that “fit” together. Ronna Welsh, owner of Purple Kale Kitchenworks, a cooking studio in Brooklyn, N.Y., suggests carefully examining recipes’ ingredient lists so you can choose a selection for the meal that will, in the end, use up whole vegetables, containers of broth, etc. So if the stuffing calls for one and a half onions, scope out a gravy recipe that will use up that other half an onion. 2. Plan ahead for “special” ingredients. So many holiday recipes call for unique, and sometimes expensive, ingredients, like buttermilk, cream, or fresh herbs that might not be used completely in one dish – and might not make sense in any other dish in the meal (see above). Welsh suggests having a plan for these ingredients before you even buy them, whether that means finding out how to store them for the longest period of time (freezing, canning, drying) or coming up with some post-holiday recipes in which they can be used. 3. Transform extras into modular (almost-)ready meals. Don’t have the patience to plan out ahead of time how everything will fit together? That’s okay – just seize the moment while you’re cooking or packing up leftovers to prep and stash unused veggies and more for use later on. By actually investing the time to prep or cook these ingredients – like sautéing an onion to use later or creating an almost-finished soup to freeze – we’re more likely to use the leftovers, says Welsh. She suggests having extra broth or stock on hand for this very purpose, since many foods freeze better suspended in a liquid. You can throw some veggies, shredded cooked turkey and extra fresh herbs in with some stock and freeze in a container or resealable plastic bag. Even months later, you can reheat the mixture (seasoning it to taste) and simmer until the flavors are blended; top with cheese or croutons or anything else you might have on hand for a quick and easy meal. 4. Don’t trash the scraps. Peelings and trimmings can be reserved for myriad other culinary uses; homemade stock, in particular, is a wonderful way to use vegetable peelings and poultry or meat bones, and it can be frozen for months so you’ll have plenty of time to enjoy it after the holiday, says Welsh. You can also mash potatoes with the skins right on, or toss the peelings with a little olive oil, salt and pepper and bake at 375ºF for 15-20 minutes until crisp. Nibble on the “chips” as a snack or use them as garnishes for other dishes. Greedy guests may be inclined to load up their plates with far more than they’ll actually eat in one sitting. Set out smaller serving spoons if hosting the meal family-style, or if you’re feeling ambitious, arrange individual plates in the kitchen and serve everyone the same selection of smaller helpings of each dish to start. 6. Get clever with leftovers. Simply reheating the same foods for days after Thanksgiving gets boring fast. And how many turkey sandwiches can you eat, anyway? Think of other ways you can transform holiday dishes into new and exciting ones. Bake stuffing on a rimmed baking sheet at 375ºF until it’s dry and crisp, then use the newly formed croutons within a week (or freeze to keep them even longer). You could also use stuffing as a base for a hearty egg-based strata on Black Friday morning, says Welsh. (Or skip the stuffing and use other leftovers to make a bread-less frittata.) She also suggests blending extra mashed potatoes with stock or broth to make a creamy potato soup; add garlic or other herbs to taste. You could even mix or mash together any complementary dishes (turkey and mashed potatoes; green beans and stuffing) and use the result to make savory hand pies with store-bought pie-crust dough; you don’t even have to bake them before wrapping them well and freezing—just pop them into a 350ºF oven until golden brown when you want to eat them). If your guests don’t finish what’s on their plate, simply transfer the remainder into a reusable container, label it with their name and stash it in the fridge until just before departure. Also offer to pack up extras of whatever other dishes are left for those guests who’d like them. 8. Still have leftover food? Find a way to compost it. Even if you don’t compost food waste yourself, chances are there’s someone in your area (a farm or specialized facility, or even an eco-conscious neighbor) who will be happy to add your table scraps to their own compost pile. Search for a composter near you on findacomposter.com. And if you fry your turkey, check into cooking oil recycling in your area. San Francisco, for instance, collects cooking oil at eight locations throughout the city. It then gets recycled into biodiesel to power the city’s fleet. 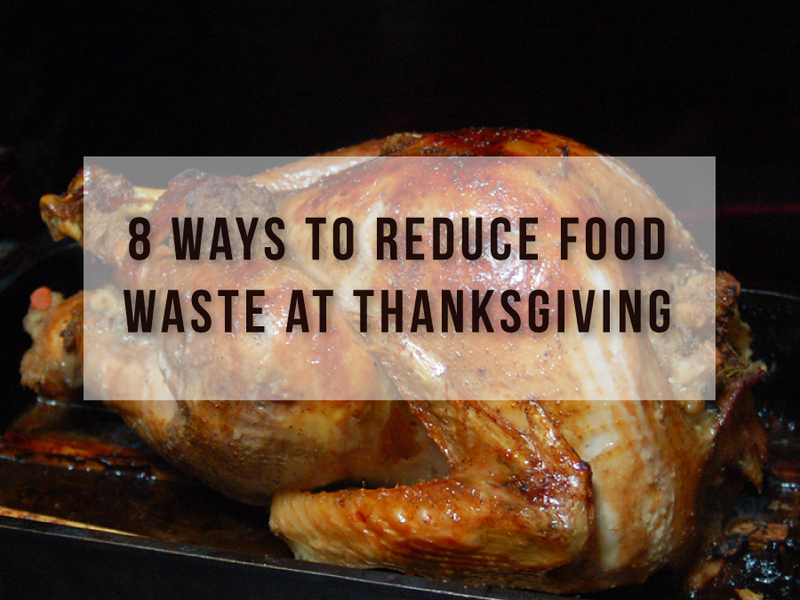 There’s no better way to give thanks for our food by making sure none of it goes to waste irresponsibly. By wasting less as you plan, prepare, and enjoy the holiday, you’ll reduce the 40% of food that gets wasted in our country. It’s also a great way to build new habits and get your family and friends involved in the issue. 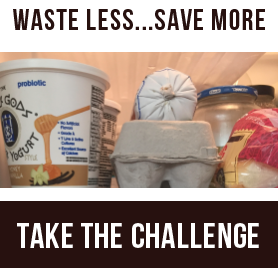 If you’re interested in doing more to reduce food waste at home, take our free, 4-week I Value Food Challenge.